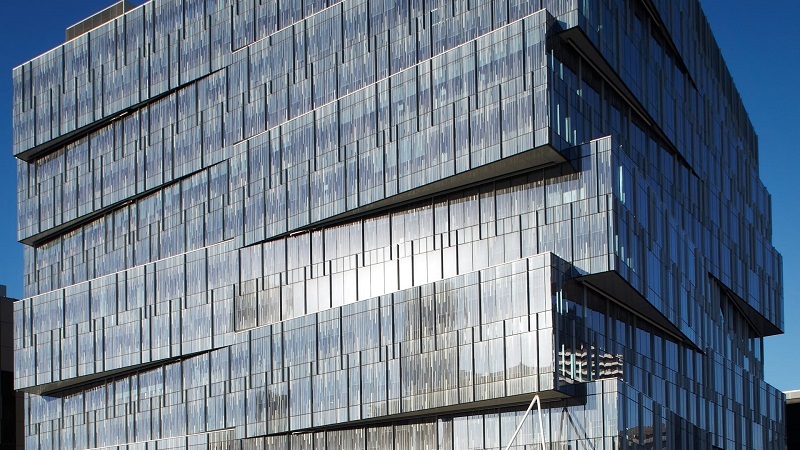 How do you clean and maintain a glass façade building when every few stories that façade is at a slightly different angle? It’s not possible to use a single access point at the roof as with a traditional flat-faced building. And, in the case of the Channel 9 building at Seven17 Bourke Street, there was far too much foot traffic to safely use elevated work platforms or scaffolding without closing the street entirely. Additionally, use of these would require special council permission each time the building needed to be accessed. Rather than a single anchor point, Bomac was able to place a separate Altrac rail on the underside of each overhung section of this unusual building. This allows each angled face to be accessed separately and completely. The system also had the advantage of being permanently available once installed making the schedule of building maintenance flexible and easier. To suit the outdoor application and ensure the trolleys stand up to the Melbourne elements, Bomac used stainless steel bearings and finished the trolleys with a triple coating of zinc, e-coat and powder coat. Altrac was specified by the architects and was put in place during construction. The rail complements the building and the Trac Trolleys have been ultimately powder-coated to match the rail rather than the standard red used in many applications. The overall effect is that the height safety system does not cause any visual distraction when looking at this distinctive Docklands icon. For more information on how we can provide you with an ideal fall arrest solution please contact us, get a quote online, or call 61 3 9796 5300.